Last time I saw this lot they were on an airline safety video. Deep in the uncanny valley. The text is sadly poo-reminiscent. Is the bear seeking the woods? Marc has his own very 2003 website. The cover for the sequel is a lot more dramatic and a bit less Taiwanese CGI news report. The cover is painful, but that title sounds excruciating in an answer-the-call-of-nature kind of way. If the “Flame in the Bowl” starts going out, just toss in a few more unsold copies. I learned from https://www.fanfiction.net/u/2361666/Marc-Vun-Kannon that Marc also writes fanfic “Chuck” episodes. That bear looks far too constipated to be shitting in the woods any time soon. BTW, I’m attempted to adopt Constipated Bear as my new band name but I suspect it’s already being taken by one of the lesser know Russian hacking groups. Please, please, please, please, please, please let that be a Chocolate Bear (life sized). That animal could kill you with its bear hands. The bear looks like he just farted (a SBD) and is trying to look casual about it. I think slippers guy just got a whif and is staring sternly at the bear, but he can’t really say anything because he’s not sure if it was the other guy who did it, but as soon as either the bear or Mr. Green Pants gives some kind of indication he’s going to put the culprit in a headlock. Amazing attention to detail on those crotch laces. Bear hates it when his daddies argue. I had to tag this as “Unknown Artist Institute” because, for some reason, this book is not listed on isfdb. My guess would have been this was a total Marc Vun Kannon production, author and artist. But looking closely between the dude’s Ugg boots I can just make out the presence of an artist signature. JuanPaul, any chance you can examine the book more closely to see if there is an artist name? Art of this quality deserves attribution. @TW Next time I visit that bookstore, I’ll see if this gem is still on the shelf. “Unbinding the Stone”? Wasn’t that that 1980s movie with Michael Douglas and Kathleen Turner? That HAS to be self-published, self-pub can do paperbacks and why else would it have that terrible low-polygon “art”? @Admin (1): I think booties man on the right got the LSD too. Sandals guy has to do EVERYTHING. Including smack himself in the armpit with his sword. @THX (3): GSS, cleverly joked. (4) The Taiwanese news might be more entertaining. @Alice (13): Quite detailed, identical, and don’t seem to connect with/to anything. Makes you wonder about Marc and/or the artist. How long does it take to unlace when nature calls? Or are they just decorative? Do they ever find The Flame in the Bowl? Is it, perhaps, a grill near a pic-a-nic basket? Or only a tiny kettledrum on fire? 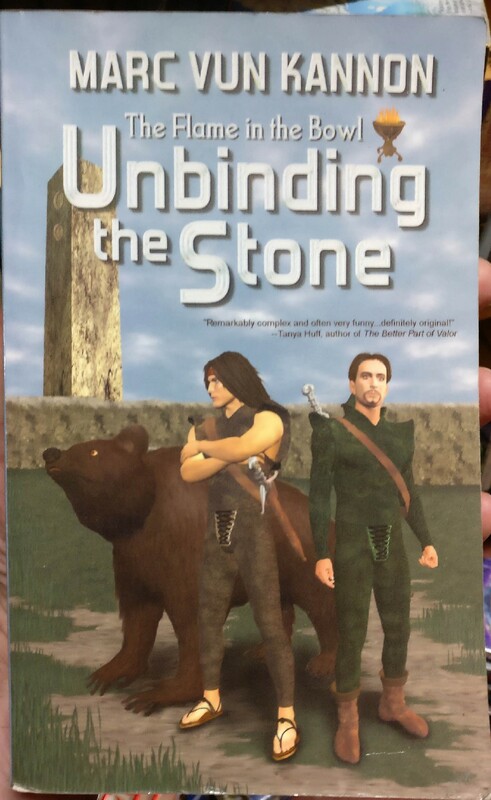 I’m thinking there’s more than one bear on this cover. @Hammy – I always wondered what happened to Joan and Jack after Romancing the Stone and Jewel of the Nile. Time wasn’t kind to either of them, I fear. And the bear? Oh, that’s just poor Ralph (Danny DeVito).